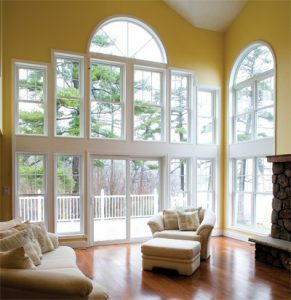 Providing Professional Window and Door Installation Services to Central Connecticut for nearly 60 years. With the increasing costs of energy, efficiency of the windows and doors in your home is key to energy conservation. Our lines of Energy Star® rated products, including Harvey vinyl replacement windows or wood replacement windows and ThermaTru entry doors, will certainly assist in decreasing energy costs within your home. We install Harvey windows because they use only premium grade materials that are able to withstand Connecticut cold winters, resulting in consistent energy savings for your family. Harvey windows are well known for their beauty, durability and unsurpassed performance and for the numerous design options available. We offer a wide selection of styles and configurations to choose from, installed using professional insulated and weather-tight methods. We also specialize in vinyl or wood patio and sliding glass doors. When it comes to windows replacement in Southington, CT or windows replacement in Meriden, CT our company has the experience you are seeking to perform a quality windows replacement job at competitive prices!